Shortly after Caroline Herschel’s discovery of Comet C/1786 P1, her brother William Herschel went to Windsor Castle to provide a viewing to King George III and the royal family. Novelist Frances Burney, who had just begun several years’ service as a companion to Queen Charlotte, noted the event in her diary. 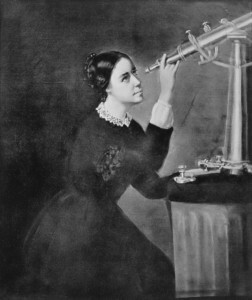 A depiction of Caroline Herschel. The BBC radio and podcast series In Our Time recently devoted an episode to Frances Burney. I still wonder if we don’t need a new vocabulary to better talk about DNA relationships. For a variety of reasons. In Winnie the Pooh we learned the category “friends and relations” which I always thought summed things up rather well. It was based on personal acquaintance, but varying degrees were implied, and it helped one realize that not all relations were necessarily friends, and that that’s OK. In some places, the old Gaelic communities in Scotland and Ireland for example, you might very well know some 4th or 5th cousins, and how you are related to them. Now that we have technology to reunite co-descendants, we should think about expanding the language a little bit. I have a hard time thinking of people I’ve never even met as cousins, and to call them relatives suggests that I grew up knowing them. Even “distant cousins” has that effect on me. On the other hand, I didn’t really meet one second cousin until he was almost grown up, but we are now both friends and relations. I think there are now regular reunions for descendants of my 4x great grandparents (on my maternal-maternal-maternal side). This is a celebration of heritage, I suspect, more than family, but I won’t really know without attending one. Are there reunions for genetically confirmed, but genealogically undocumented, distant cousins? “Sniplings” comes to mind. Then there are tribe, kin, words out of which new words could be coined. Xenokin, for instance. The genes relate us, but we are strangers in every other way, foreign to each other even as we exchange surname lists and puzzle over pedigree charts.